Made-to-order nano-cages open possibilities of shipping cargo into living cells or fashioning small chemical reactors. For University of Washington Institute of Protein Design scientists working to invent molecular tools, vehicles, and devices for medicine and other fields, the icosahedron’s geometry is inspiring. Its bird cage-like symmetry and spacious interior suggest cargo-containing possibilities. 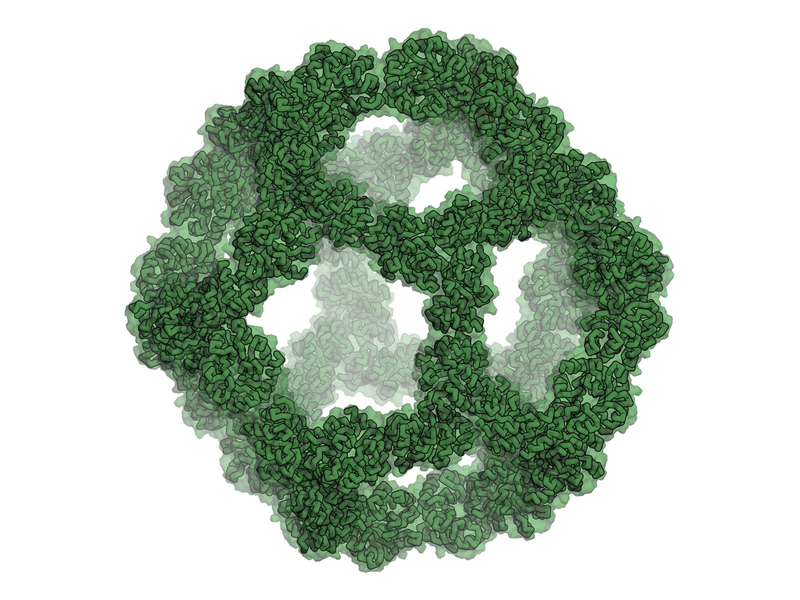 The protein designers took their cue from the many viruses that, en route to living cells, transport their genomes inside protective icosahedral protein shells. These delivery packages, termed viral capsids, are formed to be tough enough to withstand the trip, efficiently use storage room, and break apart to release their contents when conditions are right. The researchers’ paper in the scientific journal Nature reports on their computational design and experimental testing of a highly stable icosahedral protein nano-cage. Engineered at the atomic level, this nano-cage can construct itself from biochemical building blocks and information encoded in strands of DNA. After selecting the design for this icosahedral nano-cage through computer modeling, the researchers produced it in bacteria. Electron microscopy of the resulting icosahedral particles confirmed that they were nearly identical to the design model. The icosahedral nanocage with 120 copies of a fluorescent protein attached. The leads on the project were Yang Hsia, a University of Washington graduate student in biological physics, structure and design, and Jacob B. Bale, a recent graduate from the UW molecular and cellular biology Ph.D. program, and now a research scientist at Arzeda Corporation in Seattle. The senior authors were Neil P. King, translational investigator at the UW Institute for Protein Design, and David Baker, director of the Institute and UW professor of biochemistry. Baker is also an investigator with the Howard Hughes Medical Institute. Among these applications might be fabricating nanoscale icosahedral vehicles. Such research might create tiny, spacecraft-like devices that could encapsulate and deliver therapies directly to specific types of cells, such as cancer cells. The designed icosahedron, while sturdy, proved to disassemble and reassemble itself under certain environmental conditions. This reversible property is essential if it eventually becomes part of packaging, carrying and delivering a biochemical payload. The newly designed icosahedron has considerably larger internal volume than previously designed nano-cages of other shapes, and so could hold more cargo as molecular shipping containers. Working towards that end, the researchers were able to design barriers for the center of each of the twenty faces of the icosahedron. These could block molecules from entering and leaving the cage. In future iterations, gated cages might be filled to carry a medication into particular kinds of cell and then discharge it. Moreover, the protein building blocks making up the cage retain their natural enzymatic activity, which is the ability to speed up chemical reactions. This suggests the possibility of custom designing them as nano-reactors to catalyze specific biochemical processes. The nano-cages were, in addition, amenable to genetic fusions to enhance their properties. For example, the researchers created standard candles for light microscopy by adding a fluorescent protein to each of the 60 subunits that frame the icosahedron. The fluorescent intensity was proportional to the number of these proteins attached to each subunit. The distinctive shape of the icosahedron makes it a readily spotted marker. This project was supported by the Howard Hughes Medical Institute, the JRC Visitor Program, the National Science Foundation, a University of Washington/Fred Hutchinson Cancer Research Institute Pilot Award from the National Cancer Institute, the Takeda Pharmaceutical Company, the Bill & Melinda Gates Foundation, the National Institutes of Health, and a Public Health Services National Research Services Award. Listen to a podcast interview with Yang Hsai accompanying the Nature paper.